If you have never had a cavity in one of your teeth, then you are certainly a very rare and lucky person. If you do have one or ever had one, you are not the only one. By age 17, nearly 78% Americans have had at least one cavity as reported by the Surgeon General. And the good news for you is that there is a simple, and effective treatment for cavities-fillings. Fillings are exactly what the name means. The cavity is filled up and sealed. 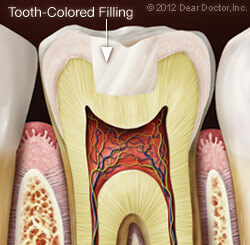 Cavities are caused by an erosion of the enamel, the hard tissue covering the visible portion of your beautiful teeth. 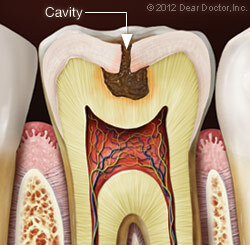 Whatever caused this cavity can cut deeper into your tooth until the pulp and nerves in there are exposed. At this stage, your tooth becomes sensitive and even painful. Further neglect can lead to severe pain, abscess formation, and even loss of the tooth. A timely filling will prevent such problems. Dental fillings are made from a variety of materials using slightly varying procedures.Their choice by the dentist and the patient depends upon various factors, such as their esthetics, strength, durability and of course! Their cost! How Teeth Fillings Are Performed? A visual and x-ray examination is used for the detection of extent of tooth decay. Normally with local anesthesia, the cavity is drilled clean. You do not feel any pain because of the prior anesthesia. Your dentist will clean the tooth cavity thoroughly, followed by roughening the surface by applying a mildly acidic solution in some cases. The rough surface will hold the filling better. The filling material is then applied inside the prepared tooth cavity. Broadly speaking, there are two categories of dental fillings: metal fillings and tooth-colored fillings. Each has its own particular merits and demerits. The choice in every case will depend on a number of considerations. Amalgam — This is the classic “silver” filling in which has been used very reliably for over a century. The dental amalgam is an alloy made up of mercury, with powdered silver, tin, and traces of copper. The mercury forms, what is technically called an amalgam. Amalgamation makes the mercury stable and safe. These fillings are strong and inexpensive. The amalgam can be readily prepared in the office. Hence the filling can be finished quickly within a single sitting. However, amalgam fillings are conspicuous and noticeable. Also, they require relatively more (drilling) than other types. Composite — If you do not want the filling to show up different, a composite filling one choice. Composites are mixtures of plastic and glass which are available in various colors to match your teeth. Composites are less expensive than amalgam but may have a slightly shorter life. Also they can crack and may even stain. Porcelain — Indirect (fabricated inside the laboratory and then attached inside the tooth)Fillings made of dental ceramics look natural, are strong, and don’t stain like composites can. They are more expensive than composites. They are made either in the dental laboratory or in the office using high-tech CAD / CAM equipment. In the latter case they can be made in a single visit. While they are aesthetically the most popular, they are also brittle, and may chip or crack. Glass Ionomer — Acrylic when mixed with glass powders makes an ionomer. Glass ionomer fillings are inexpensive and translucent fillings. They blend with the natural tooth color and also release a small amount of fluoride. The fluoride helps prevent decay. Normally they do not last as long as other fillings of other materials. The numbness due to local anesthesia prior to the filling will wear off within a few of hours. avoid drinking hot or cold liquids until then. Do not eat anything on the side of the mouth which contains the new filling. Sensitivity to hot and cold may persist for the first few weeks after the filling. If it goes beyond that, or you feel pain when biting, your filling may need a readjustment. Maintain regular oral hygiene – brushing and flossing twice every day. Also, do visit the dentist every six months for routine checkups and cleanings. Good oral hygiene and regular dental inspections and cleanings are the best means of avoiding further dental problem.